Discover the rural side of Cambodia on your drive to your hotel in Siem Reap, your stylish three night Special Stay located in the heart of Siem Reap. 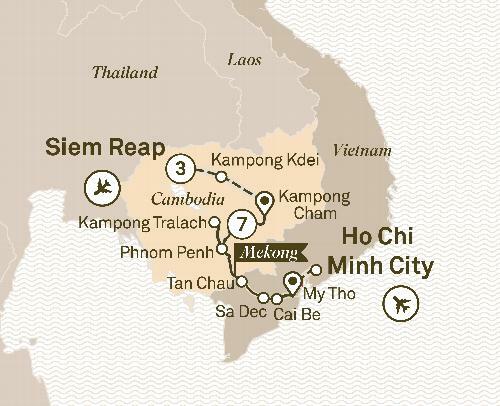 Enjoy an 11 day luxury cruise along the Mekong. Explore ancient temples, see Angkor Wat & witness the enchanting Apsara dancers at an exclusive gala dinner. Meander along the Mekong and float by the lively floating markets of Cai Be, learn about Vietnam’s French-infused past, soak up the melting pot of cultures that is Phnom Penh and discover the bright communities embracing rural river life along the Tonle Sap River. Siem Reap is home to the magnificent temples, ancient hydraulic systems and communication routes of Angkor and still today the scores of temples and relics whisper secrets of the once-imposing Khmer Kingdom. Discover it all on this enchanting journey.